Indie Retro News: WinUAE 3.6.0 - The greatest Amiga Emulator gets another feature packed final! WinUAE 3.6.0 - The greatest Amiga Emulator gets another feature packed final! Yet again after many months of beta updates with a ton of fixes and improvements, today is the day that Toni Wilen has released a brand new WinUAE version 3.6.0. Throughout last year and following on from WinUAE 3.5.0, this latest edition once again proves that this really is the best Amiga emulator you can use for playing games, watching scene demos or installing an OS ready for use on a real Amiga. In fact this is such a great release that it doesn't just feature core emulation updates such as 68030, 68040 and 68060 full instruction and data cache emulation, with or without MMU emulation. But also emulated hardware expansion updates, new emulated hardware expansions, Direct3D 11 support implementations and much much more. So see the change log below and of course the download links for further information. - 68030, 68040 and 68060 full instruction and data cache emulation, with or without MMU emulation. - 68030, 68040 and 68060 EC model partial MMU (transparent translation registers only) emulation. - 68030, 68040 and 68060 MMU emulation performance improved (added extra translation caches). - STOP-instruction CPU model specific undocumented behavior emulated when parameter does not have S-bit set. - 68020+ DIVS/DIVU CPU model specific undefined overflow condition N and Z flags emulated. - Undocumented 68881/68882 FMOVECR values emulated. - Optional Toshiba Gary slow (chip ram like) Z2 IO and/or ROM space access speed. - Cubo CD32 is now an expansion device, added DIPs, PIC game ID/language and expansion device enable options. - A2090 Combitec and MacroSystem 3rd party ROM update/adapter supported. - DKB 1230/1240/Cobra and Rapidfire flash rom write support added. - Requires Windows 7SP1 and later. Windows 7 requires KB2670838 (Available via Windows update as an optional update), Windows 8 and later does not need any extra packages like D3D9 support required (Ancient DX9 redistributable). - Requires hardware level 9.1 or higher, which means most Windows 7 capable GPUs are supported. - Variable sync (G-Sync, possibly also FreeSync) supported in windowed mode. - Many D3D9 custom shaders are supported automatically, some require manual modifications to work in Direct3D 11 mode. - Simple box art/screenshot config file support. - If Wait for Blitter is enabled and blit size makes no sense, don't wait. Fixes long delay in Vital / Mystic. 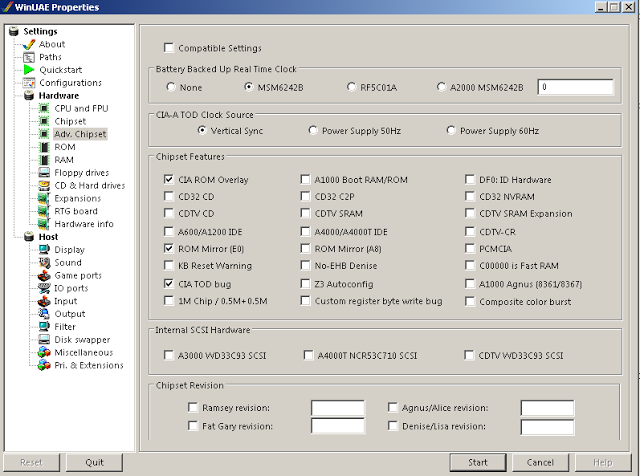 - Added "CIA 391078-01" advanced chipset checkbox. This CIA revision has a bug in IO port output mode, reading output mode port will always read output mode data state. Other models, including original DIP 8520, 391078-02 and Akiko internal CIAs read IO pin external voltage level as documented. This can affect "bad" mouse left button/joystick fire button reading code (not working or stuck button). Used in A600. A1200/A4000 can have -01 or -02 revision. - Added ATAPI Tape drive emulation. - CD SCSI emulator READ CD-DA and READ CD-DA MSF commands emulated. - Expansion device GUI changes are now always activated after hard reset. - uaehf.device hardfiles/harddrives unit number is now user configurable. - "Include CD and FMV Audio" and/or sound mode change on the fly when CD or FMV audio is playing is now supported. - Debugger assembler support (a) and some other misc debugger updates. - Added Misc panel option to show WinUAE in Windows shutdown/logoff screen (Vista or newer) if emulation session is active. - JIT Direct is allowed in CyberStorm PPC configuration but it also disables CSPPC MAP ROM hardware feature. - It was not possible to override Z2 RAM board autoconfig data if board had built-in manufacturer/product ID defaults. - It was not possible to change existing path with Select Directory/Select Archive or Plain File buttons. - Fixed 64-bit version random crashes that usually happened with some shell extensions. - Z3 RAM in manual mode was completely broken. - UAE directory harddrive/hardfile KS 1.2 autoboot hack didn't work without extra reset if UAE autoconfig board wasn't first board in autoconfig chain. - 68030 data cache emulation corrupted data if write was cached, write size was word or long and address was odd. - 68040/060 without FPU: many FPU instruction F-line exceptions generated incorrect stack frames. - ECS Denise BPLCON2 ECS-only bits (for example KILLEHB) were masked unless AGA was also selected. - Obsolete IDE FORMAT TRACK command fixed. - GamePorts panel custom mapping incorrectly parsed joystick autofire state from config file. - Directory filesystem ACTION_SET_DATE failed to change date stamp if file was read-only. - uae-configuration joystick port (joyportx) modification only queued but didn't apply changes. - uaeserial.device crash fixed. DTR/RTS state now match serial.device behavior when device is opened. - Fixed uaegfx VRAM size check, some modes that almost filled whole VRAM didn't appear in resolution list. - uaenet.device didn't close low level ethernet handles when Amiga was reset, causing duplicate packets. - Tape drive emulation fixes. Fixes Amix install error if last file on tape was selected for install. - First avioutput recorded frame was sometimes partially corrupted. - When saving state with avioutput active: last frame before state save was not recorded. - Number of avioutput frames buffered (waiting for compression thread processing) counter was reset periodically which caused lost frames (and leaked memory) in recorded video if CPU was not fast enough. - Delay initialization until first display frame or sound buffer recording request comes, previously "before filtering" option may have used wrong display size in some situations. - Uncompressed video selection is not forgotten anymore. - First frame was not rendered (and also not recorded) if statefile was restored when emulation was already running. - If emulator state was changed (debugger breakpoint, statefile save etc..), last frame before state change was not recorded. - File splitting (2G limit) incorrectly flushed sound buffers causing random sound glitches. - Added -max_avi_size <bytes> -command line parameter to set split size. - If recording was started and GUI was never opened in same session, sound recording rate become 44100Hz, causing AV syncronization issues if real rate was not same.